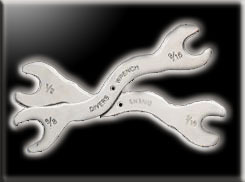 Deep Six in Vero & Stuart Florida: Reef, Olukai sandals, Yeti, Costa sunglasses, Aqualung Dive equipment - REPAIR DEPT. Home » Categories » SCUBA » REPAIR DEPT. 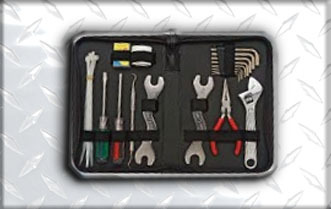 This kit comes in zippered pouch and includes 2 specially developed Scuba Wrenches (wrenches have 4 sizes which fit most regulator 1st stage hose attachments), high quality crescent wrench, Phillips head and flat head screw drivers, 8 piece hex wrench set, needle nose pliers, professional o-ring tool, 8 tie wraps, 1/4 oz. jar silicone grease, and 10 piece o-ring kit. 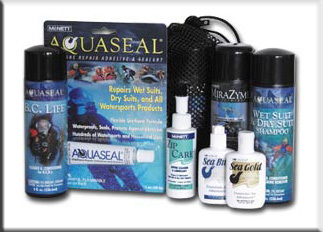 <z>Diver's Value Pack Every diver will appreciate this Diver's Value Pack for protecting, repairing and preserving valuable dive equipment. Each Value Pack includes our most popular "Essentials for Adventure": 1 oz. AquasealÂ® Urethane Repair Adhesive & Sealant, 11/4 oz. Sea Goldâ„¢ Anti-Fog Gel for Dive Masks, 11/4 oz. Sea Buffâ„¢ Dive Mask Precleaner, 2 oz. Zip Careâ„¢ Zipper Cleaner & Lubricant, 8 oz. B.C. Lifeâ„¢ Cleaner & Conditioner for B.C.D.s, 8oz. Wet Suit & Dry Suit Shampoo, and 8 oz. MiraZymeâ„¢ Odor Eliminator. Packed in a handy mesh bag.